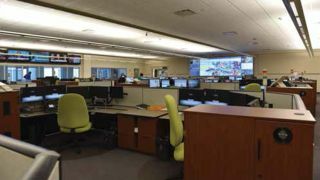 The Montgomery 911 Call Center’s new informational tools and visualization system have transformed the workflow of its dispatchers. In 2014, Emergency Communications Director Larry Fisher noticed some workflow obstacles affecting the 911 Call Center’s dispatchers. Seated at isolated workstations with only desktop monitors to display their information, the dispatchers had no visibility into the calls being processed by other team members. This siloed workflow made it difficult for them to identify connections between calls or determine if a call pertained to an already-reported incident. The lack of a real-time common operating picture limited situational awareness. “The video wall provides everyone with a visual as to what’s going on throughout the city,” said Larry Fisher. As dispatchers answer emergency calls, they now use the video wall to monitor their phone system, radio, and the CAD mapping platform, which shows the locations of emergency callers and response units on a live map of the city. Equipped with this real-time common operating picture, the dispatchers are now able to visualize patterns in incoming calls and quickly identify connections between incidents.